Update for ‘Football Manager’ fans. It probably tells me something about the state of the talent management ‘profession’ when a book on baseball proves to be the best source I could find on how to use statistical evidence to identify and deploy talent. Let me stress immediately that this is no slight on the game of baseball nor its loyal fans. Far from it. As a Brit who only ever played baseball on very rare occasions at school (but who far preferred it to that other inscrutable, arcane game of cricket) I did not realise just how much analysis could go into what appeared, on the field, to be a very simple game: a bit like management really. That is why you need to read on regardless of whether you like baseball or books on sport. What Michael Lewis has done is truly remarkable. Not only can he write in wonderfully lyrical prose, about a topic that could be as dull as ditch water, he has done the world of human resource management a great service by producing one of the most illuminating management books of all time. It should certainly be a set text on the desk of anyone currently pretending that they know anything about talent management. This is currently the apogee of evidence-based talent management and it has already been around since the mid-90’s. It’s time you were practising it. The book is based on a well-researched, true story that has already been turned into a film starring Brad Pitt. 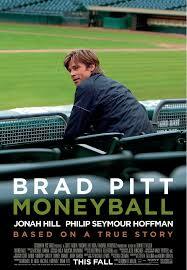 Pitt plays the lead role of Billy Beane, the legendary general manager of the Oakland A’s baseball team who used statistical principles to recruit talented baseball players that conventional wisdom, experienced scouts and competing teams had all failed to spot. The real coup though was that Oakland could not afford the most expensive players so, as un-spotted talent is cheaper talent, Billy Beane was able to compete successfully with the teams that had the deepest pockets (any premiership football managers reading please take note). The film, wisely in my view, spends less time on the statistics and more on the fascinating, character-based study of Billy Beane’s own life: a guy who apparently possessed every talent required, enough to be one of the greatest baseball players ever known, but who never achieved the potential he held out as a youngster. As an avid film-goer I enjoyed the film, as an avid evidence-based HR fan I really enjoyed the management expertise in the book: my copy has numerous, neon, post-its inserted on the many pages that contain useful management lessons. The aspect of the book that is most relevant here is the battle between conventional baseball management and the application of new thinking; specifically Sabermetrics. Conventional scouting in baseball looked for 5 specific talents, more colloquially referred to as ‘tools’ comprised of “the abilities to run, throw, field, hit and hit with power”. When it came to selecting players for the season the scouts would sit around a table and discuss the merits of their favoured players. In essence, the book shows how conventional management is blinded by impressions of talent rather than any rigorous, evidence-based method of selection. It also explores the battles that Billy Beane and his colleagues had in turning around the conventional wisdom that was born out of the many years of experience gained by hard-bitten scouts, coaches and managers. This is precisely the challenge facing the evidence-based manager today – replacing intuition and non-evidence-based methods with rational management. This short review cannot do justice to Michael Lewis’s achievement in drawing out many life lessons with a masterful blend of cold statistics and human endeavour. There are certainly passages in the book that might only interest the über-geeks of baseball statistics and other sports-stats nerds, but the reader wanting to learn about sophisticated, human capital management will easily find plenty of other episodes here where you can smell the sweat and almost bite off a wad of the bitter-tasting, chewing tobacco ever-present in this ultra-macho, testosterone-fuelled world. There is also plenty of entertaining viewing to be had from the film itself with enough pathos to satisfy anyone who has ever known what it feels like to have personal ambition and talent cruelly thwarted. This entry was posted in Book Reviews, Evidence-based management, HR Management theory, HR metrics & analytics, Performance management, Talent Management and tagged 5 tools, Brad Pitt, Moneyball. Bookmark the permalink.